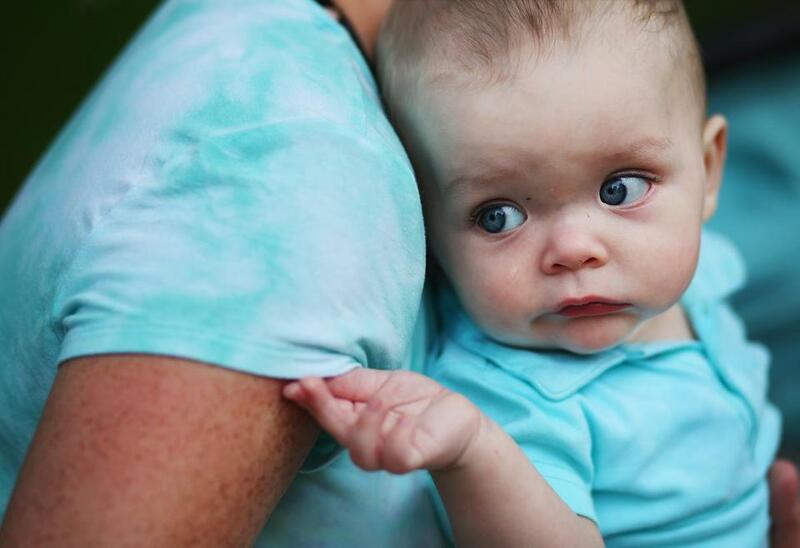 Liam, 6 months, looked over the shoulder of his mother Elizabeth during a visit to a Manchester, N.H., park recently. MANCHESTER, N.H. — In a park at the center of the historic manufacturing city, Elizabeth looked up and bristled. Instinctively, she reached her hand out to cup the back of her baby’s head. Laden with a car seat and bottles full of pumped breast milk, the 33-year-old seemed far removed from the men pocketing folded bills nearby. But Elizabeth is in recovery from a decades-long opioid dependency. She is taking Suboxone to prevent withdrawal and reduce the cravings for opioids, works with a counselor, and attends weekly meetings for moms in recovery at Catholic Medical Center here. As the opioid crisis plows through New Hampshire, increasing numbers of women are becoming pregnant while opioid-dependent. Some, like Elizabeth, were on medication-assisted treatment for years before conceiving. Others become pregnant while actively using, which can prompt them to enter recovery. Over the past few years, new methods of supporting opioid-dependent women from pregnancy through birth to parenting have cropped up around New England. Clinicians have placed a new focus on parent-centric methods of care, working to lower the amount of time babies need to stay in the hospital and decrease the number who are medicated through withdrawal. Hospitals around the region also have implemented programs to help mothers in recovery, providing support that takes them from pregnancy through birth to parenting. Babies born to opioid-dependent mothers often go into withdrawal a few days after birth. A 2017 University of New Hampshire study found that the number of infants across the state born with neonatal abstinence syndrome increased fivefold from 2005 to 2015. Signs of the syndrome include tremors, seizures, and breathing problems caused by withdrawal. Dartmouth-Hitchcock, the only academic medical center in New Hampshire, sees around 8 percent of the 1,200 or so babies in the state delivered each year exposed to opioids in utero. Ashley Raymond, with her daughter Mila, said getting treatment while she was pregnant changed her life. 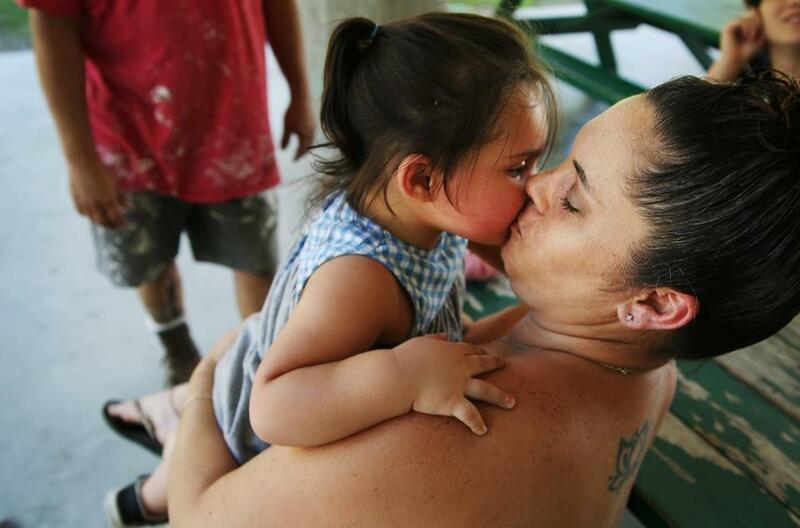 “I was so close to losing my kids,” she said. A woman who becomes pregnant while dependent on opioids will often want to quit cold turkey, which could send her fetus into withdrawal or even cause a miscarriage. Clinicians around the region have started treating infants using a new holistic approach known as Eat, Sleep, Console. If an opioid-dependent infant can eat, sleep, and be soothed, clinicians rarely suggest more intensive treatments, such as morphine drips or feeding tubes, used in the past. To many, this approach might seem intuitive: Hold a baby when he cries. But to doctors, it’s revolutionary. Researchers have found that when a baby in withdrawal is held against a parent’s chest, the infant’s temperature normalizes, hormones stabilize, and sugar levels adjust. Rates of anxiety and depression, in turn, decrease for the mother. Since Dartmouth-Hitchcock started using Eat, Sleep, Console several years ago, the number of babies who underwent pharmacological intervention has declined from 27 percent to 7.5 percent. The average length of stay in the hospital has been cut in half, from 12 days to six, officials said. Other hospitals in New England, including Yale New Haven, Boston Medical Center, and Boston Children’s, also have embraced the method. Elizabeth, who asked that her full name not be used because relatives do not know she is being treated for addiction, used Eat, Sleep, Console with her son, now 9 months old. As her baby entered withdrawal from buprenorphine — a drug that controls cravings and prevents overdoses — days after his birth, Elizabeth and her fiance took turns swaddling their son, pulling blankets snug around his body. Lindsey Miller, who is pregnant with her second child, attended group meetings at Dartmouth-Hitchcock Medical Center. In the dim lights of their quiet, private room, she breast-fed him, drawing strength from being the one uniquely able to care for him in that way. Most importantly, she kept the baby pressed to her skin, letting her body soothe him. Hospital birthing pavilions, where delivery and recovery take place, have also evolved to address the needs of opioid-dependent babies. There, parents can “room-in” with their children in low-lit, semiprivate settings. Volunteers known as “cuddlers” relieve parents who might need to nap in the first tense days after birth. This one-stop approach extends throughout pregnancy and well after birth. In specially designed wings at Catholic Medical Center, women have a central location to meet with obstetricians and pediatricians, therapists, and recovery coaches. They can pick up their Suboxone treatment along with donated diapers, attend group sessions with other mothers in recovery, or meet with social workers. The convenience of centralized recovery centers is essential in a largely rural state like New Hampshire, which in 2016 had the third-highest rate of deaths due to drug overdose nationwide. The communal spirit reassures pregnant women, many of whom struggle with the anxiety of anticipating their infants’ withdrawal. They often find role models in attendees who have already given birth, seen their children through withdrawal, and are stable in their recovery. 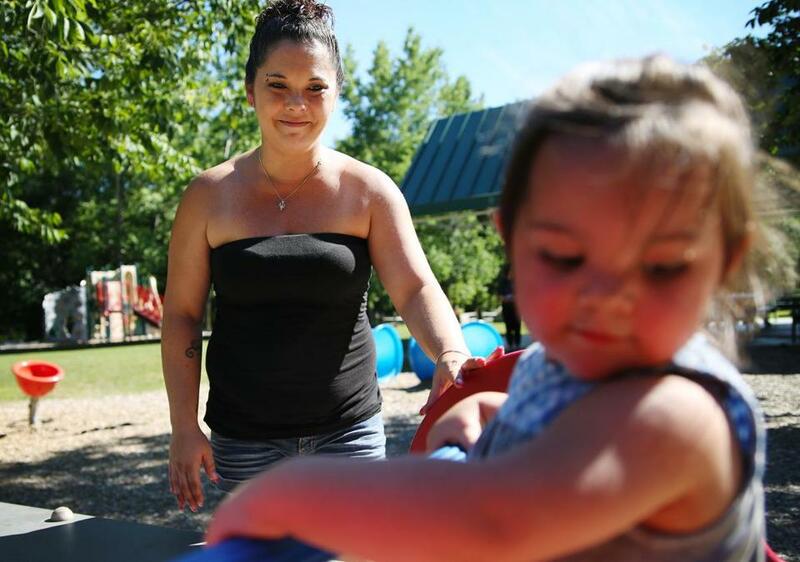 For Ashley Raymond, who has attended the Moms in Recovery group at Dartmouth-Hitchcock for almost two years, getting treatment while pregnant changed her life. 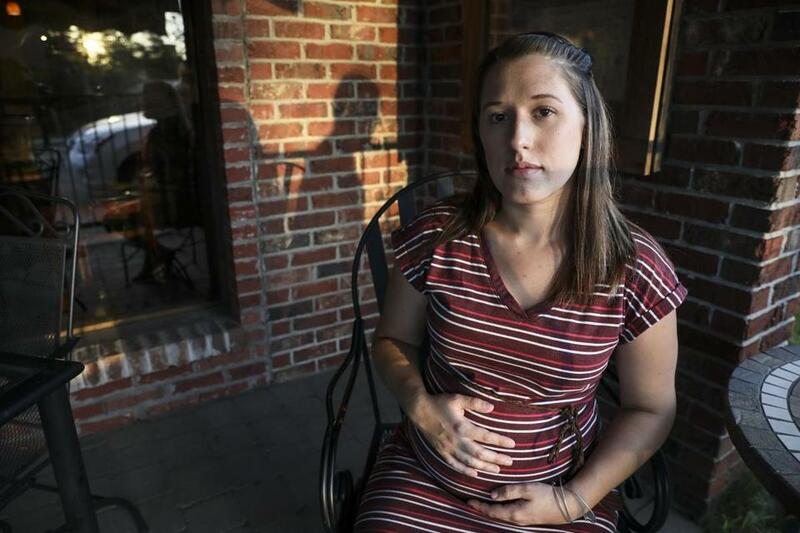 After years of heavy opioid use, the 31-year-old was arrested when she was eight months pregnant with her second child, a daughter, born opioid-dependent. Now, she serves on the patient advisory board and gives out her phone number to women just starting recovery. Raymond lamented the missed milestones with her first child, a son now 4 years old. Raymond blinked back tears and lifted her daughter high overhead, their laughter intertwining. Mila, she had named her. Miracle. Raymond also serves on the patient advisory board at the hospital and helps other women in recovery.